HH66-03 Nala Pounces at the St. Thomas International Regatta stunning the fleet and taking 1st in Offshore Multihull Class. 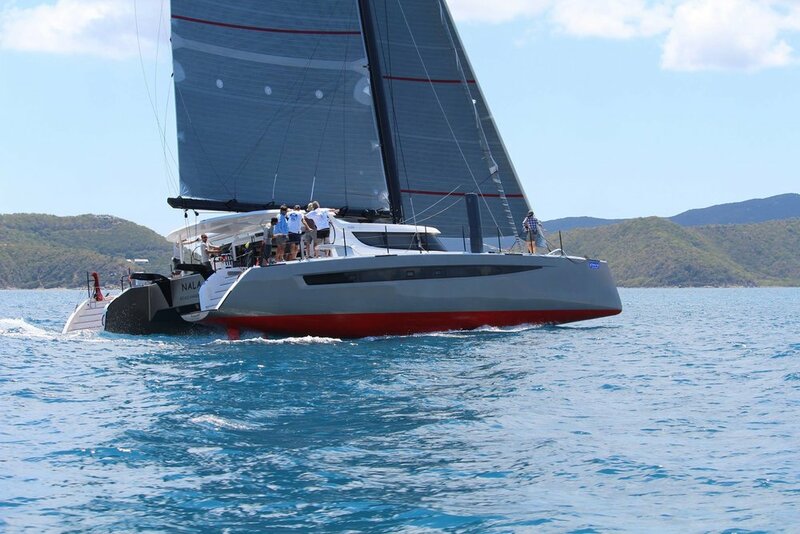 HH Catamarans latest launch, HH66-03 Nala, took 1st Place in the Offshore Multihull Class at the St. Thomas International Regatta over the weekend, beating three Gunboat 60s and the previously unbeaten Bieker 53. The event marked Nala’s racing debut, and the strong performance out of the gate left little room for doubt that Nala will be a formidable opponent for the fastest amongst the Offshore Multihull fleet. A spectacular weekend of racing at the St. Thomas International Regatta wrapped Sunday, with the newly launched HH Catamarans HH66-03 Nala emerging as the champion of the Offshore Multihull Class. Amidst a tough fleet including three Gunboat 60s and the formidable Bieker 53, Nala sailed with shrewdness, speed and consistency, taking three 1sts and two 2nds and claiming 1st overall on the weekend. Race 1: Won the downwind start, lead all boats in 6-12kts of breeze around the course to a bizarre finish? Course was shortened, maybe improperly? But we got the horn, called RC on VHF, they confirmed yes we had finished first but it did not feel right... after some hesitation and discussion on board we decided to continue the race out to the final island and back.. got windy and Fujin hunted us down in a full hull flying screaming reach! They passed us just shy of the 2nd finish!! RC has not posted results but however it pans out we showed everyone Nala's fast! *Race committee eventually honored the original course after a protest from GB60 Arethusa. Nala finished with a 2nd place on corrected time. Race 2: Fast and furious! Reaching start with one reef in 18-22 kts with puffs to 33... We escaped the start line first and low on the pin end. We screamed to the corner of the first island rocks hull flying with the Bieker 53 Fujin breathing down our necks. Rounded the rocks with Fujin but we made a better set to our A5, Hound height downwind sail. Fujin had a gear problem and couldn't raise their downwind sail. We rounded leeward mark first and headed back upwind to island turning mark. We rounded first with Fujin recovered and hot on our heels again! We power reached at 22-24 kts with top speed of 26.7 towards the finish. Fujin sailed over us with both boats screaming within a couple boat widths at times. Fujin finished less than a minute in front of Nala with the GB60's Flow and Fault Tolerant trailing. Arethusa had a DNS with a gear issue. Race 3: Saw a slight drop in windspeed to 17-18 at start. We shook out our reef on Nala right before the reaching start. Fujin aggressively pivoted at start disrupting our perfect record of starts and they ended up early but blocked our pin end start forcing us to sail below the pin and jibe around with them chasing down GB60's Flow and Fault Tolerant. Fujin made a better recovery and quickly overtook the two GB60s. We overtook the two GB60s a few minutes later. Fujin lead to the reaching mark and continued upwind to the weather mark. We followed several minutes later and set our A5 again. Surfing and sailing deep back to the leeward mark with Nala's crew whooping it up as we dropped in on the 6'-8' waves. We rounded the leeward mark and blast reached back to the finish behind Fujin and ahead of Flow and Fault Tolerant. Race 4: The reaching start with squared line in 17kts windspeed lead to a fast hull flying blast to corner of St Thomas island. We got a good pin end start with full main and North J1. We had the Bieker 53 Fujin to leeward and GB60 Flow to weather. We punched out quickly to a 4-5 boat lead and gave Fujin another hard reaching duel! Fujin sailed over us with both boats hull flying in the Caribbean sun! Fujin beat us to the corner, made a good set and lead us all to the downwind mark. We set our masthead North A4 asymmetric spinnaker. Fujin made a better layline call and jibed in to the leeward mark going 18-20kts. We followed 3-4 min later with GB60 Flow not far behind and GB60 Fault Tolerant behind them. GB60 Arethusa did not start for equipment reasons today. Fujin sailed mistake free back upwind to the corner and lead back to the finish on a tight reach. Fujin was first on elapsed and corrected. HH66 Nala was second on elapsed and corrected. GB60 Flow was third on elapsed and fourth on corrected and GB60 Fault Tolerant was fourth on elapsed and third on corrected. Race 5: Last race... we on HH66 Nala were tied in points with Fujin at six each. Winner of this race takes all! Long course this time with half a dozen mark roundings, half a dozen islands or rocks to miss as well as ferries, barges and 20-30 other STIR competitors! Same reaching start in 17kts of breeze with full North 3Di main and J1. We rolled over Fujin at the start line to weather with a bit more pace. As usual she regained her ground and this time passed us to leeward on the way to the corner of St Thomas island and the short jump to the turning mark by St John. Fujin lead all the way around the course but never able to shake our dogged pursuit. We used our A4 big asymmetric downwind, our 3Di overlapping Solent upwind and Doyle A5 reaching back to the finish in 15kts true wind speed. In this race Bieker 53 Fujin took first on elapsed and third on corrected, HH66 Nala took second elapsed and first on corrected, GB60 Fault Tolerant took fourth on elapsed but second on correct and GB60 Flow took third on elapsed and fourth on corrected.